I read and loved Wildlife last year, and I was disappointed to learn it was actually the second book in this duology. These books were originally published in Australia, and Poppy decided to release them out of order in the US for some reason. I enjoyed Wildlife so much that I was hoping to get my hands on a copy of Six Impossible Things, and I was excited when I realized it was being published in the US, too. Six Impossible Things focuses on nerdy Dan Cereill - a teenager trying to deal with the fact that his father just came out, moved out, and left them with some major financial issues. He and his mother have had to move, so now he's facing a different school and a huge crush on his neighbor. In an attempt to regain control of his life, he makes a list of six impossible things he want to accomplish. Wildlife, on the other hand, takes place some time after the events in this book and uses a secondary character from Six Impossible Things as its the heroine. The biggest problem with reading them out of order? Something significant happens in the time between the two books, and reading Wildlife first means that you know what's going to happen to one character before you end start Six Impossible Things. It bothered me! While I didn't think Wildlife would work for everyone, it was right up my alley. I enjoy stories about friendship, especially when a story highlights the beauty and the heartbreak in it. As a result, I went into Six Impossible Things with high expectations. Unfortunately, I found myself a little letdown by the story. I still enjoyed Wood's writing style. I loved how Dan's voice was very different from Lou's and Sib's in Wildlife. It felt true to this character and captured his awkwardness, insecurity and hopefulness. Both books focus more on character development than plot, which makes the pacing a bit slow at times. It worked for me in Wildlife, but I just wasn't as engaged with this book. Dan made some questionable choices, and I didn't totally understand his infatuation with Estelle. I liked that he has moments of real maturity and other where he seems young for his age because it made him seem realistic. The book didn't seem to have much of a plot (and was resolved a little too easily), and I wasn't invested enough in the characters to make up for it. I was so much more connected to the story in Wildlife, and I think it's because I could personally relate to the story. While I liked Dan, I don't think I was ever invested enough to truly root for him. Six Impossible Things is a quick and quirky read, but it wasn't one that will stay in my memory. I don't know if part of my issue is that I kept mentally comparing it to Wildlife or if this just wasn't quite right for me. I wouldn't dissuade anyone from reading it, but there are a number of other contemporary books I'd likely recommend first! This is the first I've heard of this book, and I have to say that the bit about a gay dad in the summary caught my attention. I know LGBT representation has been getting more attention lately, which is great, but that just made me realize that I don't know of any YA books with LGBT parents. I'm sure they exist, but I don't think it's as common (if you could even call LGBT representation common at all). I think that alone increased my interest in the book. It makes sense to have books about teens with LGBT identities that LGBT teens can relate to, but I bet there are teens out there with LGBT parents too who would love to read books about other teens with LGBT parents too. Six Impossible Things was such a quick read! I remember starting it and just flying through the pages right away. 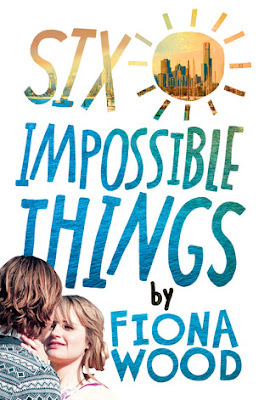 There's something about Fiona's ability to write about these odd, flawed, wonderful characters, and I really enjoyed that aspect of this story.